The ancient temple believed to be founded by Lord Parasurama is declared as a National Monument by the Archaeological Survey of India. Vadakkunnathan Temple at Thrissur also known as Rishabhari or Thenkailasam ( the Kailash of the south) is one of the ancient and most prominent Shiva kshetram's (temples) of Kerala. Situated on top of a beautiful hillock, the temple is a classical example of the Kerala style of architecture depicting many decorative murals and works of art. Vadakkunnathan temple houses a museum of ancient wall paintings, wood carvings and art pieces of immense historical value. It is famous for its spectacular Pooram Festival celebrated annually in April -May every year. It is a stunning event, combining the majestic elephant pageantry with the frenzied playing of drums and cymbals, rounded off with a fireworks extravaganza. 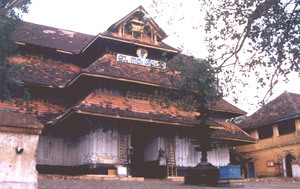 Vadakkunnathan temple is believed to be built by Lord Parasurama, one of the incarnations of Lord Vishnu. The temple complex is a massive one covering an area of about nine acres. The vast maidan about 65 acres around the temple is called Tekkinkadu or forest of teak woods. Once, many years ago there used to be a beautiful teak forest here, now the ground is scattered by dozens of peepal trees. The four magnificent gateways called Gopurams facing the four directions and the massive masonry wall around the temple quadrangle gives the temple an imposing appearance. The multi-shrined internal temple complex (nalambalam or chuttamabalam) is situated in the center of this vast enclosure. There are five separate shrines inside the nalambalam for five separate deities. These central shrines are dedicated to Shiva, Parvati, Ganapati, Sankaranarayana and Sri Rama (Vishnu). Lord Shiva, more popularly known as Vadakkunnathan, is the principal deity and the circular srikovil (shrine) of Shiva is on the northern side. The unique feature of the temple is that, the idol of Shiva i.e the Shivalingam facing west, is worshipped in the form of a mound of ghee or clarified butter. This is formed by the daily abhisheka with ghee over the years. The ghee never melts in spite of several lamps in the sanctum or even in hot weather nor has any bad smell or is infested by insects or pests. The centuries-old ghee is considered to possess medicinal qualities and cures many ailments. The eleven feet high mound of ghee is embellished with fifteen cascading crescents of gold and three serpent hoods at top. The main offering is ghee and Kadali bananas. The outside wall of the shrine has a big painting of Mohini holding a mirror. The same shrine is divided into three compartments. Just behind the Shiva idol, in another compartment, there is Parvati's idol, facing east. The image of goddess Parvati is around three feet and is made of wood. The idol has three eyes and is dressed up in gold crown, ornaments and red silk. The main offering and prasadam is the turmeric powder. Devotees bring ornaments and silks, place it in front of this idol to get blessings before marriages. Sankaranarayana's shrine, which is circular, double storied and facing west, has beautiful murals of the seventeenth century delineating graphically the story of the Epic Mahabharata. The idol of Sankaranarayana is the combination of both Lord Siva and Lord MahaVishnu. It has four arms, which carries a white hatchet and trident on the right side and Panchajanyam the shell and Club on the left side. The offering to Sankaranarayana is the abhisheka using water (panchajanyam). The two-storied shrine of Sri Rama facing west is at the southern side. Lord Maha Vishnu is being worshiped here as Sri Ram. The walls of this srikovil is decorated with murals and wood carvings. Abhisheka with pure gingelli oil is the main offering here. Ganapati's shrine is situated on the left side of the main shrine of Lord Siva. The idol of Ganapati which is depicted with four arms, is considered to be looking into the place where the offerings for the gods are being prepared. The Udayasthamaya pooja (a special ritual) of Vadakkunnathan temple is really meant for Lord Ganapati. This offering of appam (sweetened rice cake fried in ghee) to Mahaganapati is one of the most important offerings at Vadakkunnathan temple. Propitiating Ganapati here is believed to be paving a path to prosperity and wealth. The devotees revere elephants as Lord Ganesh incarnate. At the nalambalam, there is a small triangular opening on the wall. 'Thazhikakudams' or finials of the three main shrines can be seen through this opening. It is believed that this darshan is equal to seeing several holy temples of India like Kashi, Rameswaram, etc. Apart from these idols, Lord Vettakkaran (Shiva in hunter form) is also worshipped within the nalambalam enclosure. This idol supposed to be the guardian of Vadakkunnathan temple is situated on the northern side facing south. A striking feature of Vadakkunnathan temple is the temple theatre known as Koothambalam, which is on the left of the main entrance i.e. western gopuram. This is the theatre hall for staging 'koothu', an ancient dramatic form of art famous in Kerala. This structure is considered to be a masterpiece of its kind, crowned with three kalasams ( finials). It is a marvelous structural workmanship with sloping roofs of carefully enmeshed copper plates, austere, dignified and aloof. Outside the nalambalam, all round at a certain distance, there is the Pradakshina vazhi (circumambulatory path) which has a uniform width of seven feet. There are shrines for Lord Krishna, Rishabha, Parasurama, Simhodara, Dharmasastha and Adi Sankaracharya along this path. At the main entrance of the Vadakkunnatha temple, there is a stone called 'kali'. The shrine of Lord Krishna (Gopalakrishna) is on the left of the main entrance. Koothambalam is in front of this shrine. The ritual is that we make a thud sound by striking a wooden plank situated on the right side of door of srikovil before we pray in front of the image. A little beyond on the north side entrance of the nalambalam, situated the shrine of Rishabha or bull, Lord Siva's mount. The idol here is supposed to be asleep and a noise has to be made to wake him up. Therefore the devotees has to offer a thread from their dress and snap the fingers while praying. The shrine of Parasurama i.e the 'thara' or platform is in the north-east corner in which Parasurama himself is supposed to reside. Dharmasastha shrine is at the southwest corner of the circumambulatory path. A little beyond there is a rectangular enclosure of stone walls without roofing in which there is a Sankha and Chakra commemorating Adi Sankaracharya. Adi Sankaracharya is supposed to have spent his last days in this temple. Just outside the western gopuram there is a peepal tree with a paved platform, which is called "Sreemoolasthanam." It is believed it was at this spot that Parasurama, after consecrating the deities of the temple, met the Nambudiri Brahmins, the traditional priests of Kerala temples, and handed over charge of the temple to them and disappeared. There are no annual utsavams or other celebrations in the Vadakkunnathan temple except Shivaratri. The annual Pooram festival celebrated here is not associated with the presiding deity in the temple. Even though the Tekkinkadu maidan is the venue of the pooram festival, no special pooja or offerings are received on the occasion. Thrissur Pooram, the most colourful temple festival of Kerala, attracts large masses of devotees and spectators from all parts of the State and even outside. It is a grand eight day festival with elephant, parasols, drums and fire works. It is marked by huge, colourful and very noisy procession joined by people of all religious communities irrespective of caste. 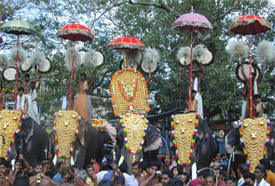 The beautifully caparisoned elephants in two processions represents the Tiruvambadi and Paramekkavu temples.Elaborately bedecked elephants specially decorated with lamps and palm leaves process to the Vadakunnathan Temple carrying priest and deities to the accompaniment of extra ordinary drumming. On the final temple team meet on the Tekkinkadu Maidan for the drumming and kudamattam competition. The festival terminates with a huge display of fireworks. It has been the regular annual practice at the Vadakkunnathan Temple for the last 20 years to conduct a large-scale Ashta Dravya Maha Ganapathy Havana and Aanayoottu (ceremonial feeding of elephants) on the 1st day of Karkidakom as per the malayalam calendar. Partaking in this function is believed to be a blessing not only to the elephants but also to the devotees. 'Gajapooja' also is conducted once in four years. Presently, the administration of the Vadakkunnathan temple rests with the Assistant Commissioner under the Cochin Devaswom Board. The temple is declared to be a National monument by the Archeological Survey of India. The temple opens at three in the morning and closes about 10-30 after the morning rites. For the evening worship it opens at four and closes at 8.30 at night after 'Trippuka', the last rite for the day. Non-Hindus are not permitted inside the temple except during the pooram festival. In addition to its religious function, the temple was the center of an extensive administration with legal and tax raising powers. According to the legends, the deities Shiva, Sankaranarayana and Rama were installed and worshipped by Parasurama. It is believed that Parasurama after restoring the land of Kerala from the ocean, wished to install an image of Shiva, prayed to Shiva that he should manifest himself there. Opening his eye, Parasurama found the image of Mahavishnu. He installed this image as Rama and not satisfied with the manifestation of Mahavishnu, Parasurama continued his meditation. At its culmination, he saw a Shivalingam, ie. Shiva on one side and Rama on the other. Again on further meditation, he saw Sankaranarayana or the combined form of Shiva and Vishnu in the middle of the two deities. He was now satisfied and realized that Siva and Vishnu are in fact one and the same.